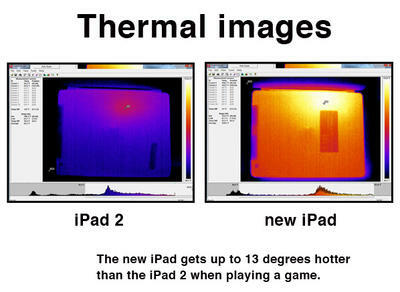 Consumer Reports has released its new iPad thermal tests as promised. The watchdog group found that Apple’s new iPad heated up to 116 degrees fahrenheit while playing games, 13 degrees hotter than the iPad 2 during the same tests. Consumer Reports also found that the new iPad 2 did not charge while a game was being played, even though the tablet was plugged in.